In San Fernando Valley today, however, on a formerly vacant plot of land a small urban farm has emerged to help reconnect the region to its agricultural roots. Founded in 2011 in Panorama City by Elliott Kuhn, Cottonwood Urban Farm is a sustainable farming venture that not only offers a reliable source of locally grown fruits and vegetable to area restaurants, chefs, and community members, but also functions as an educational resource for the community. Cottonwood Urban Farm uses succession planting and intercropping to make the most of its 1/4 acre of urban farm land in downtown Panorama City. Growing in fertile loam rich soil, Cottonwood provides an abundance of fruits and vegetables for its weekly stand at the popular Altadena Farmers’ Market in Los Angeles County. As well as a variety of seasonal vegetables such as root crops and fair weather greens, Cottonwood grows herbs, wild flowers and processes honey from the bees that live on the property. Kuhn’s specialty is fruit, and the farm currently offers apricots, melons, grapefruit, pomegranates, peaches, pluots, mulberries and nectarines. Education is a core objective at Cottonwood Farm. Indeed, Kuhn supplements the farm’s income by taking part on a regular basis in Sustainable Economic Enterprise of Los Angeles’s (SEELA) Bring the Farmer to Your School program. The program provides funding for local farmers to bring their produce to local schools, educate children on the benefits of growing their own food, making better food choices and of course, letting them sample a few home grown wares. Another program that Cottonwood Farm has established is its youth rehab program. Kuhn was invited a few years ago to create an ecology curriculum for a young offender’s rehab center. After a year, funding for the program dried up. Despite that minor detail, every Friday the rehab center’s residents come out to the farm for a couple of hours to enjoy what Kuhn refers to as “horticultural therapy.” Many of the center’s residents complete group projects at the farm as part of their exit process. Some even commute independently to the farm to volunteer before commuting back to the home in an effort to transition from the rehab center to everyday life. Cottonwood Farm recently received a grant to collaborate with Vision Zero Initiative, a progressive urban organization focused on community safety and awareness. The farm also began a collaboration last year with Pacoima Beautiful, another area nonprofit. Their joint Sustainable Saturday initiative turns the farm into a meeting place for local food swapping. The farm recently connected with a local church which has its own restaurant. Kuhn works closely with the chef to provide the vegetables to a steady number of weekly customers. Despite a successful farm with a growing reputation, Kuhn is eager to change directions and spend more time and utilize more space on the property for cultivating his personal propensity for fruit trees. Kuhn’s plan is to remove 40 garden beds and transition the space into an orchard. 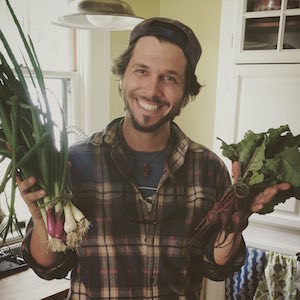 Kuhn wants to help promote the concept of the backyard orchard into the urban environment and reconnect the land to the city’s agricultural heritage. Like many urban growers, Kuhn sees the urban farm as a hub for social activity and a place where differences mean little, where there is growing to be done.